This is actually an ad card for HarperCollins Publishers, but it doesn’t really look like one. It was designed and printed by Boomerang Media, a UK-based marketing company. My partner, “JaMaJo” sent me a handmade postcard and an ATC. The ATC took a little bit of a beating on its way through the postal system, but it’s still cute. “Try them, try them and you may! 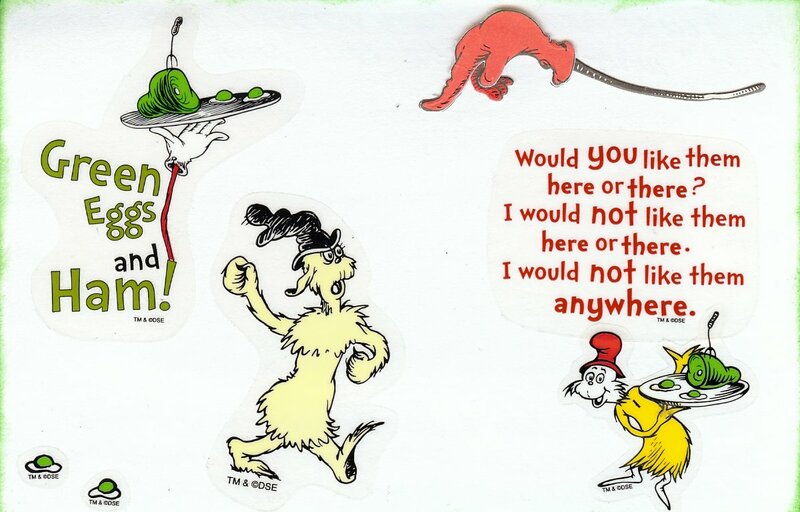 Dr. Seuss reminds me of childhood reading and fun. I loved reading as a child and read every book I could get my hands on. I spent hours on weekend afternoons lying in my bed reading. I vividly recall my Beverly Cleary phase. 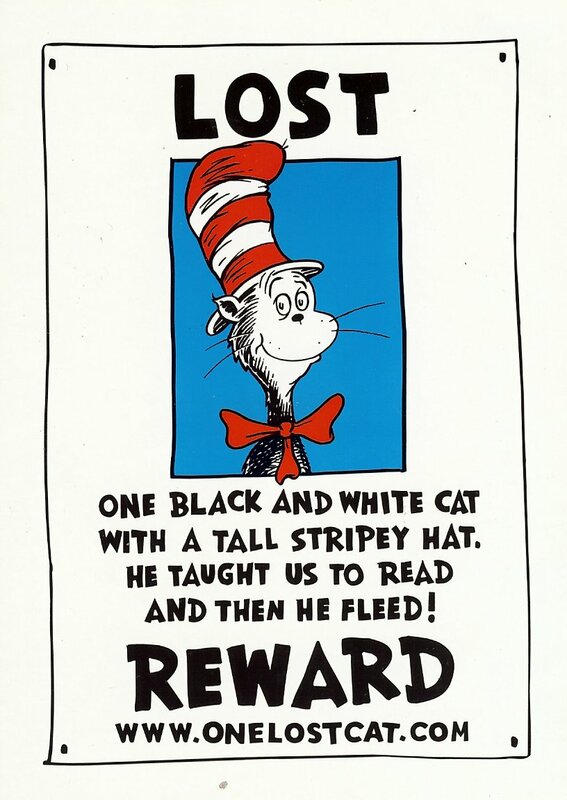 Although our teachers encouraged reading and often offered incentives, we didn’t have cool programs like the NEA’s Read Across America; nor did we celebrate Dr. Seuss’s birthday. I feel like I missed out on something big (like I do when I see that baby dolls can do so much more now), but one of the wonderful things about having a young child is that I can re-visit my childhood through him and with him. So I celebrate RAA/Dr. Seuss’s birthday with him. Last week, his first/second grade class participated in Read Across America and held a weeklong celebration of Dr. Seuss. The kids read and shared their favorite books and ended the week with a birthday celebration/Dr. Seuss-themed costume party. They also completed a few creative art projects. If you’ve been following my blog, you should know I was thrilled to see the children’s art (see earlier post on children’s art) . I photographed some of the projects just so I can enjoy them a little longer. Let’s take a look at some of the art from Adrienne Saulsbury’s class. This first set features the children’s artistic renderings of “The Cat in the Hat” (Click any image to view larger). I think they’re pretty good for first and second graders! I can’t draw as well as some of them as an adult! The second set showcases book covers the students created. 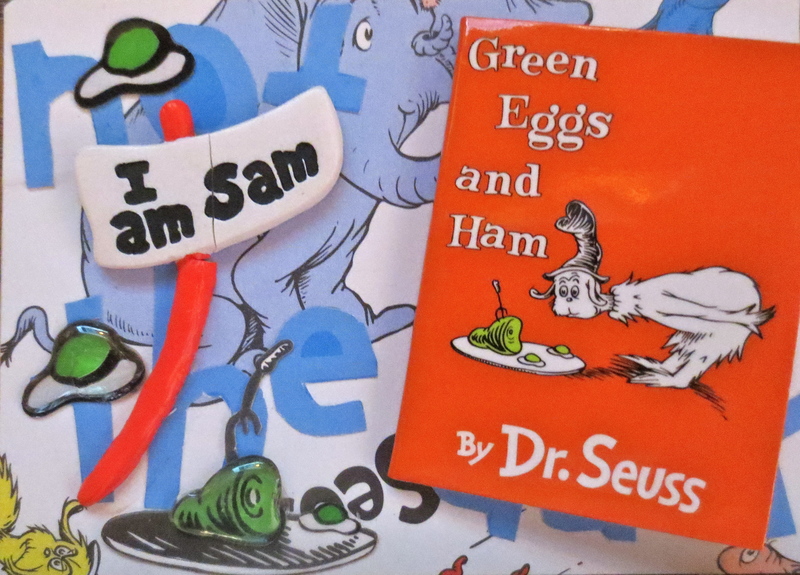 Inspired by There’s a Wocket in My Pocket, the students came up with a silly book title that included a made-up item that rhymed with a real object. I’m convinced these art projects not only stimulate creativity, but they pique the children’s interest in reading. Isn’t that what celebrating Dr. Seuss’s birthday is all about? I appreciate Mrs. Saulsbury for focusing so much on reading and for doing what she can to make reading fun for her students. She encourages the children and parents to read together daily. She reminds parents that they should read to their children and their children should read to them. She even urges the children to keep a reading log. My little one has been reading since he was 3. He is quite a reader and although he claims he has to “be in the mood,” we have never had a problem getting him to read. He reads everything–the Bible, storybooks, serial novels, kid-friendly comic books, magazines, informative books on robots (of course), space, science and nature. We sometimes read as many as 5 or 6 books in one evening–down from 10 (when he was much younger). Reading is such an important fundamental skill. Without it, the other skills can be inaccessible. If you want to get into some Dr. Seuss this week, check out Lysa’s Illustrator Study list on Amazon for suggestions. There’s something for all ages. Brain Pickings also offers a number of excellent posts on Theodore Geisel (Dr. Seuss): WWII Political Propaganda Cartoons and The Seven Lady Godivas and The Secret Art of Dr. Seuss. Oh, I almost forgot. 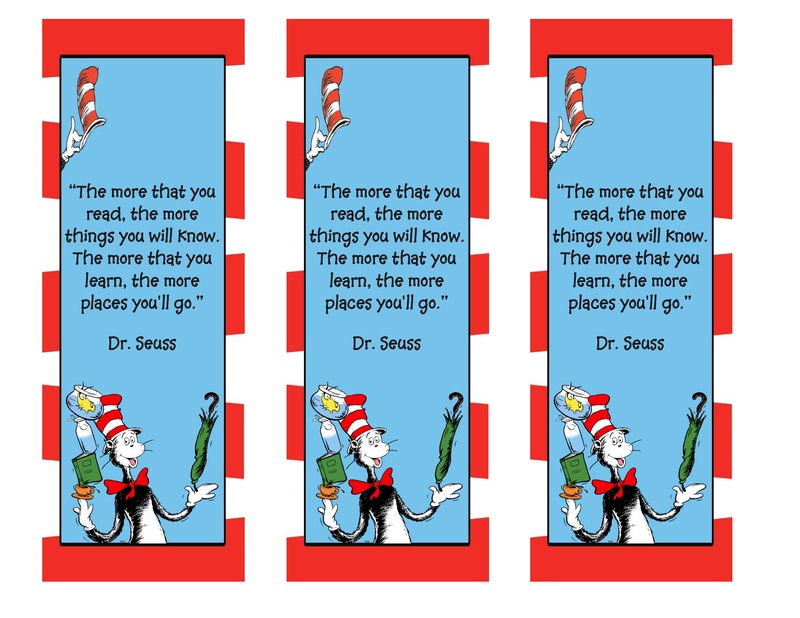 I created two bookmarks for the class, and now, I’m sharing them with you. I designed these using papers and elements from myfuninvites.com. If you have any problems downloading any of these, let me know via “comment” and I’ll deliver the bookmarks to you via email and, if necessary, in another format. Hi Jeanie. Thanks for your enthusiastic comment! 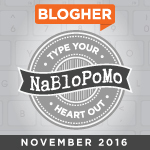 You can download the bookmark by clicking on the image. Then, ally have to do is print it on card stock and laminate. If that’s too much trouble, just shoot me an email with your address and I’ll send you one. Have joy!